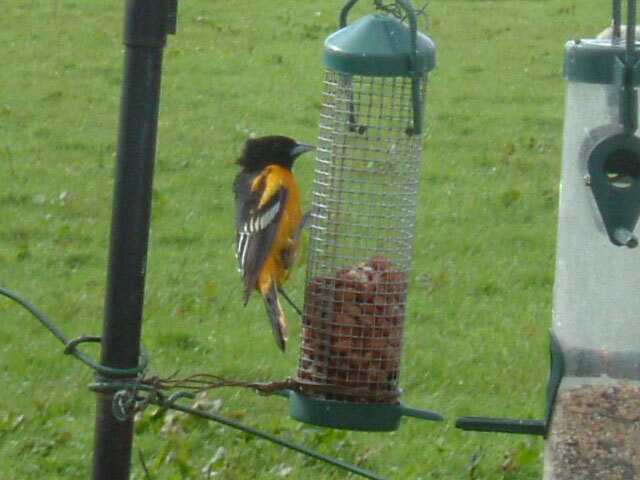 Baltimore Oriole (Photo: Ally McLean). Any notion that only "everyday garden birds" visit peanut feeders are instantly dispelled by pictures that are causing some discussion amongst the birding community. 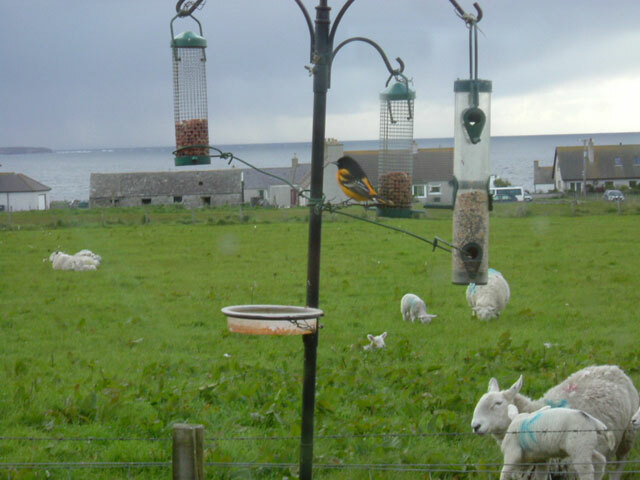 The pictures taken at Huna, John O' Groats, Caithness, show one of the most unusual, and eye-catching, birds recorded in Britain this year - a Baltimore Oriole. As the name suggests, it shouldn't have been within a few thousand of miles of the northern tip of the Scottish mainland, but serenading its mate in the woodlands of North America. A number have crossed the Atlantic before, including a well-watched individual in Oxfordshire in the winter of 2003/2004, but this one has made history by being the first adult male in full breeding plumage to have been recorded anywhere in Europe. But this unique occurrence hasn't sparked a mass dash to John O' Groats, because news of its appearance broke after the bird had gone. Unfortunately it was only present from 24th-27th May. "We have only been putting out peanuts in our garden for a few months and normally nothing out of the ordinary comes to feed so I was astonished when this very colourful bird appeared", said finder Ally McLean. "But I couldn't identify it and it was only through taking photographs and video and showing them to people with more experience of birds that we found out what it was - but by then it had disappeared." Explaining how the oriole came to be in northern Scotland at this time isn't simple, as there are various possibilities, explained Martin Scott of the RSPB. "Normally an American bird in Britain in springtime is assumed to be a bird that came across the Atlantic the previous autumn and is now migrating northwards, but on the wrong side of the ocean. "But lately there has been a series of reports of American species in Scotland, giving rose to speculation that some special weather circumstances have caused a spring crossing. "Maybe birds arriving at an eastern North American location such as Newfoundland have 'overshot' the coast and on heading out to sea have ended up being carried across by the recent strong westerly winds." Another possibility is that it crossed the ocean on a ship - like another American songbird, a White-throated Sparrow, that was seen in the port of Southampton after the arrival of a liner from New York recently. Over the past few days other North American birds recorded in Scotland include a Dark-eyed Junco on St Kilda, 100 miles out into the Atlantic from the mainland west coast, Baird's Sandpiper and Pectoral Sandpipers on the Isle of Tiree, Argyll, a Pectoral Sandpiper on North Uist in the Outer Hebrides and a Buff-breasted Sandpiper at Rattray Head, Aberdeenshire.